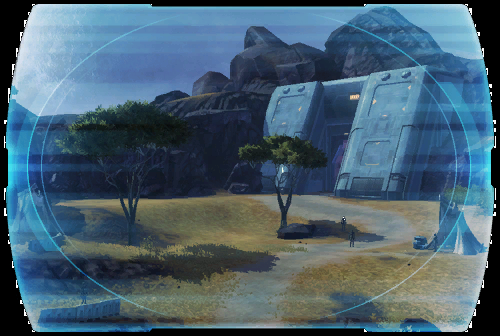 Republic intelligence operatives traced a coded Imperial transmission to a hidden outpost on Ord Mantell. It appears the Empire has been operating this spy base for years, taking advantage of the planet's civil war to mask its presence. The listening post is buried underneath a small islet a short distance from Fort Garnik, virtually on the Republic's doorstep. SIS tacticians are now re-evaluating military strategy on Ord Mantell in light of this discovery. If the Empire has been observing Republic troop movements in the area, there's no telling what they may have told the Mantellian separatists. A longstanding member of the Galactic Republic, Ord Mantell is a world of deep seas, tall mountains and lush islands. Traders and merchants from across the galaxy ply their wares in Mantellian ports, along with black marketeers and other underworld forces. In recent years, Ord Mantell has become embroiled in civil war, as anti-government separatists encourage Mantellian independence in the face of a brutally corrupt government with ties to organized crime. The Republic is responding with military force, and the fighting has resulted in high numbers of civilian casualties. Shuttle traffic is currently directed to the island of Avilatan.